In July 2017, the University of Utah’s Kem C. Gardner Policy Institute published an eye-opening research brief entitled, Utah’s Long-Term Demographic and Economic Projections Summary. Though relatively short in length, it revealed staggering implications for Utah’s water providers as they plan for Utah’s near-doubling of its current population to 5.8 million people by 2065. As the research brief’s projections are realized, the effects on the Central Utah Water Conservancy District’s service area will be great. The counties within the District’s boundaries will absorb over half of the projected growth with Utah County alone expected to increase by over 1,000,000 people by 2065. Three District counties, Wasatch, Utah, and Juab, rank 2nd, 3rd, and 4th, respectively, in projected growth rates. And though not a top-ten finalist in growth rate, Salt Lake County will add nearly 600,000 people to the mix. What a challenge—what a wonderful challenge! One that we accept willingly. The District will continue to move forward to provide a safe and secure water supply. It will be done with remarkable employees working to lead the water industry. Solutions, some easy, but most not, will include both water conservation and new water project development. They will include both building new infrastructure and replacing the old. They will require the collective strategies and imaginations of both staff and trustees alike. Yes, with that thought in mind, let’s look forward to the exciting years ahead. Central Utah Water is governed by a board of Trustees representing eight Utah counties. The Board of Trustees provides a check and balance between rural and urban representation. The appointed citizen board governs the affairs of the District and establishes policy. The purpose of Central Utah Water’s management team is for managers and supervisors to coordinate schedules and to discuss what is happening in the District. The management team meets weekly to update each other on project status’ and to address any other District concerns. 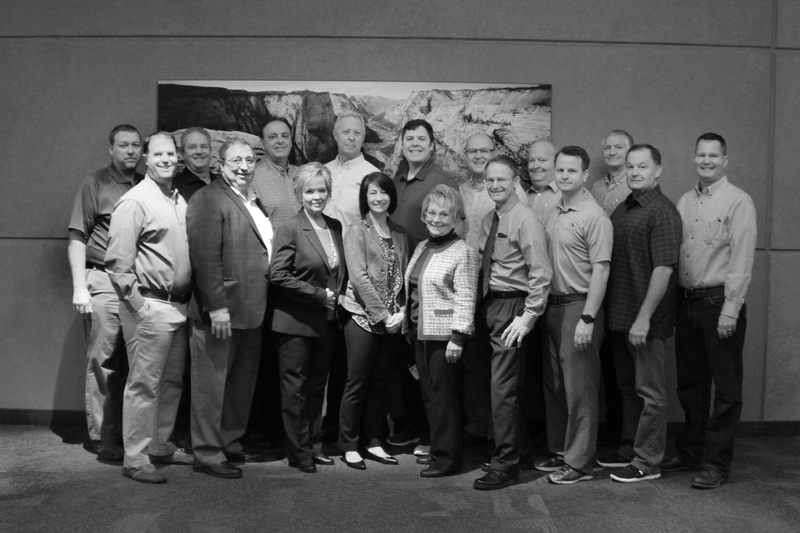 This team helps keep District operations in sync and drives the vision of the District forward. The primary focus of Central Utah Water’s Human Resources team is to have the right people in the right place at the right time. This means having qualified personnel that align with our mission, vision, and values; that fit our culture; and that can perform their jobs in an excellent fashion to meet the goals of the District. In 2017, an employee team was organized to develop a leadership program for interested District staff. Every 6 to 8 weeks, the District hosts a leadership training session. Central Utah Water had another impeccable safety year. Our experience modification (EMOD) value has been as low as our carrier has ever seen. 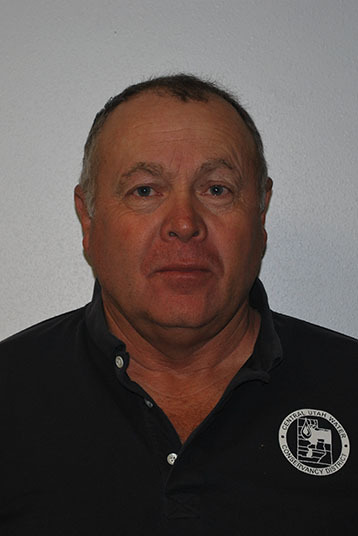 Hats off to Central Utah Water’s managers and staff who are careful and put safety first. 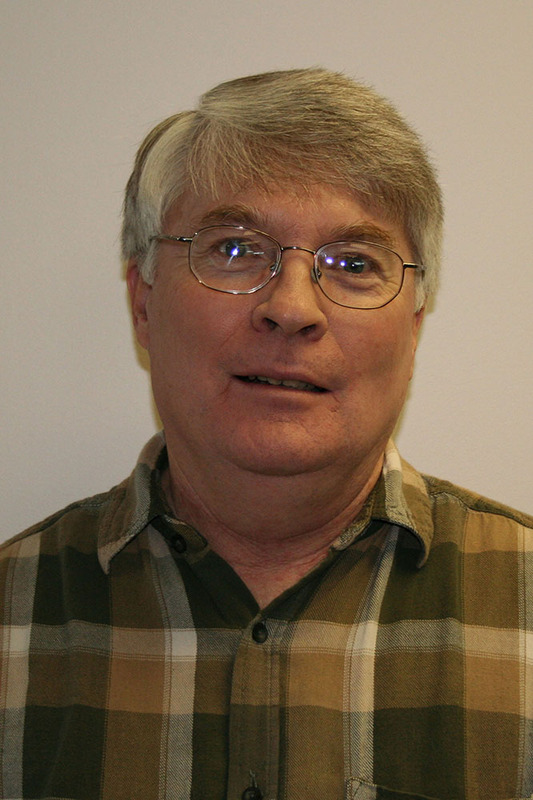 Central Utah Water’s Finance team works hard to manage the District’s finances. This year, they were able to save $11 million on a new $222 million refunding in a short period of time. This refunding was a result of the quick action of our team and finance partners who saw the opportunity to get a good rate. This will save Central Utah Water over $700,000 a year. 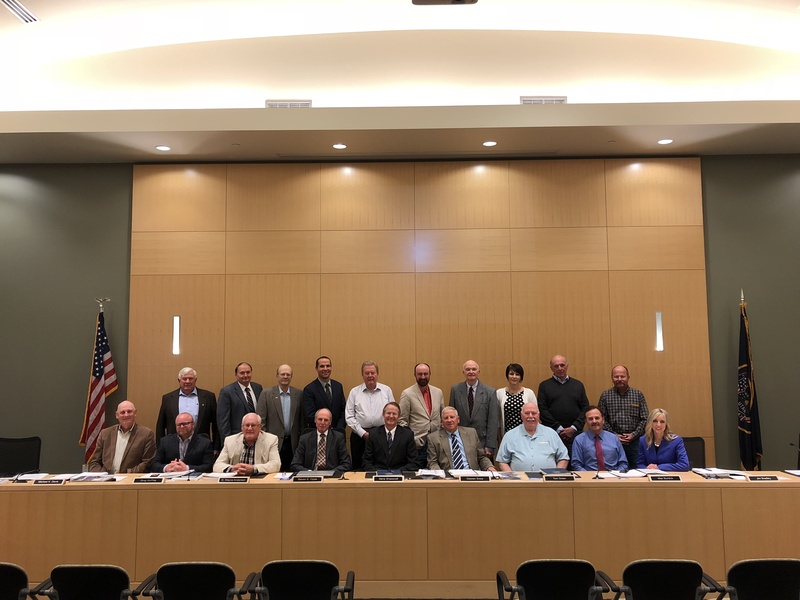 The Finance team also coordinated and obtained new bonds for WCWEP, helping them receive funding for canal linings and a new pond expansion in Wasatch County. Central Utah Water also had a clean financial audit in 2017 which was completed in a very timely manner. Central Utah Water’s Grounds team installed a new sprinkler system in 2017. The system, which was damaged by a lightning strike, needed to be updated, and was successfully replaced during the summer. Additionally, a remodeling of the front foyer area to increase security was also completed. Finally, the grounds team helped to prep an area behind the garages at the main office for a utility trailer that will be used for the various District operations. The Records team strives to improve efficiency in managing information for Central Utah Water. Throughout 2017, our Records staff, a two-person, full-time, employee team, responded to over a dozen public records requests, processed over 6,000 documents into the system, and worked with District staff to make sure that the public has legal and open access to District records. The Central Utah Project Completion Act (CUPCA) team had many successes and achievements in 2017. The construction of the initial reach of the Spanish Fork-Santaquin Pipeline began. 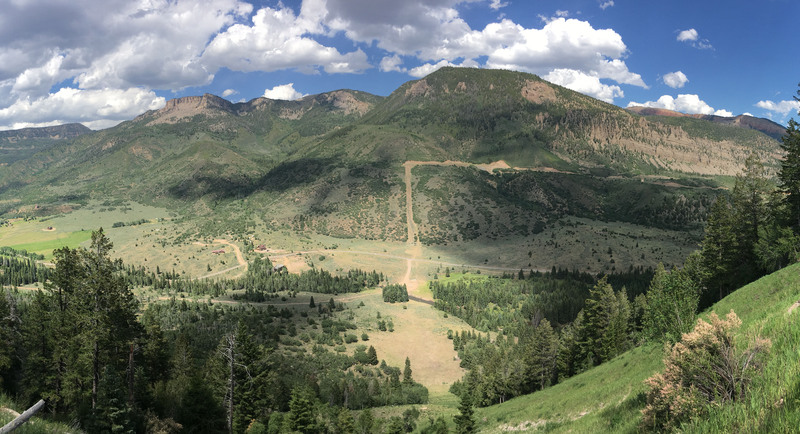 This 60-inch, 17-mile pipeline connects to the Spanish Fork Canyon Pipeline at the mouth of Spanish Fork Canyon and will continue south to Santaquin. The pipeline will include several water delivery turnouts to 8 cities within south Utah County. CUPCA staff bid out the first 8,500-foot reach of the pipeline, known as the Spanish Fork Reach, in the spring of 2017 with construction beginning soon thereafter. This initial reach includes two crossings under railroad tracks, crossings under three state highways, and a crossing of the Spanish Fork River, all of which were substantially completed by the end of 2017. This section of the Spanish Fork-Santaquin Pipeline is projected to be completed in the summer of 2018. Preliminary Design and aerial flight work for the South Fields Reach and the Salem Canal Reach began in the spring of 2017. The first construction contract for a portion of the South Fields Reach is planned to be bid in 2018. The water conservation credit program proved to be successful again in 2017 with over 130,000 acre-feet of water conserved this year, greatly exceeding the annual goal of 80,000 acre-feet. The Central Water Project (CWP) team continues to design and construct new additions to the system. In 2017, a wellhouse was constructed for CWP Well #13. CWP also contracted to drill three additional wells, Wells #8, #9, and #10. These wells are located in Vineyard and will be challenging projects because they are situated in densely-populated, residential areas. The drilling contractors on these projects will be required to install 30-to-40 foot tall sound barriers around each site before drilling begins. Once drilling begins, it cannot be interrupted without the risk of losing the well. Two new wellhouses for Wells #14 and #15 were constructed on the Vineyard site, and are scheduled for completion in June 2018. Additionally, a planned shutdown of the 800 North Aqueduct occurred. 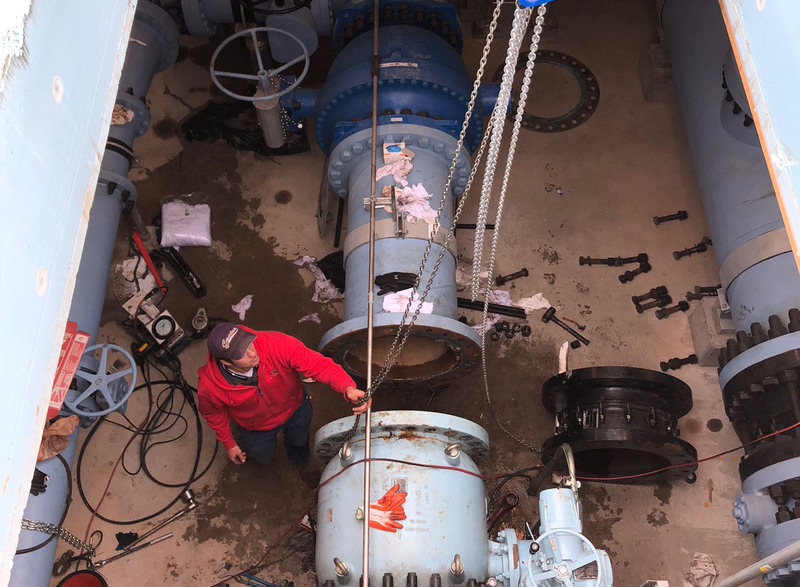 Our team was able to inspect the aqueduct and make minor repairs to the pipeline lining and replace a seal on a pressurereducing, flow-regulating, plunger valve. This year, CWP delivered a record of 11,539 acre-feet of water and plans to surpass that amount in 2018. In the coming year, CWP will deliver high-quality drinking water from Wells #13, #14, and #15, in addition to Wells #11 and #12, which are already in operation, and from the Don A. Christiansen Regional Water Treatment Plant. Drilling for Wells #8, #9, and #10, will continue, and construction of the Vineyard Wellfield Collector Pipeline will begin. 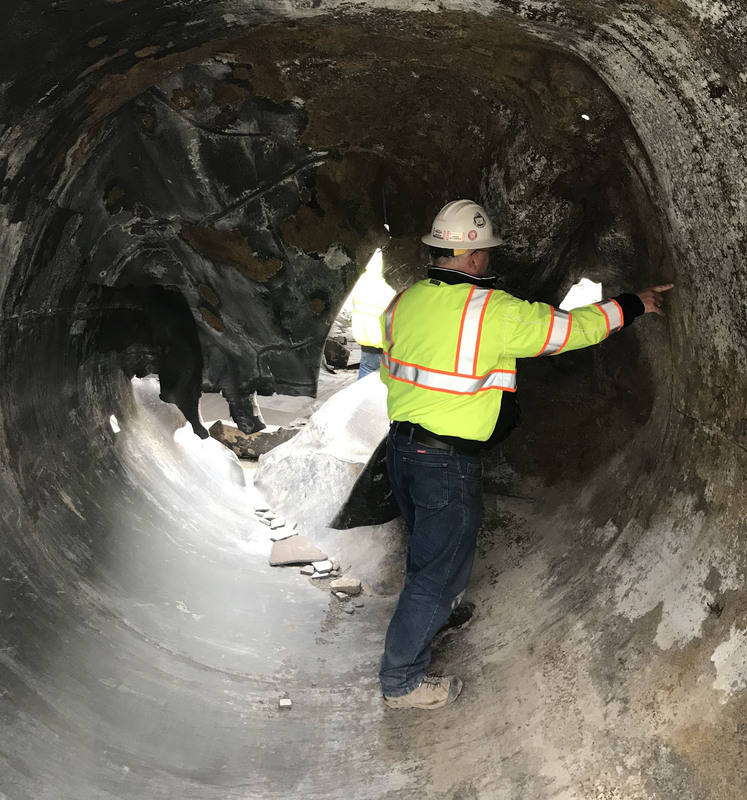 CWP personnel also plan to inspect the North Shore Terminal Reservoir and the Vineyard Connector segment of the North Shore Aqueduct. Central Utah Water owns and operates several facilities that help realize District goals. In 2017, all three of Central Utah Water’s treatment plants met their water quality goals and delivered more water than in any prior year. 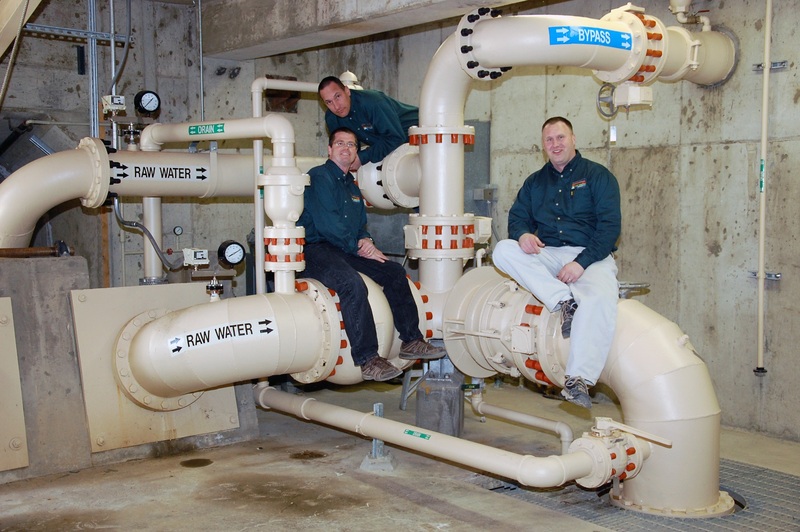 The Don A Christiansen Regional Water Treatment Plant (DACRWTP) surpassed one of their own very challenging, internal, water-quality goals, of finished water being below 0.10 NTU, 100% of the time, for more than 2,800 consecutive days. This was a great accomplishment for the staff of the DACRWTP. The DACRWTP delivered 27,785 acrefeet of finished water, also a new record for the treatment plant. The Ashley Valley Water Treatment Plant (AVWTP) also met all of their water quality goals for the year. 2017 was the second year in a row that the plant has set a new annual production record. They surpassed 2016’s production by producing 3,990 acre-feet of water. AVWTP also completed a significant process replacement project, the backwash chain and flight system, which processes solids from the filter backwash water. 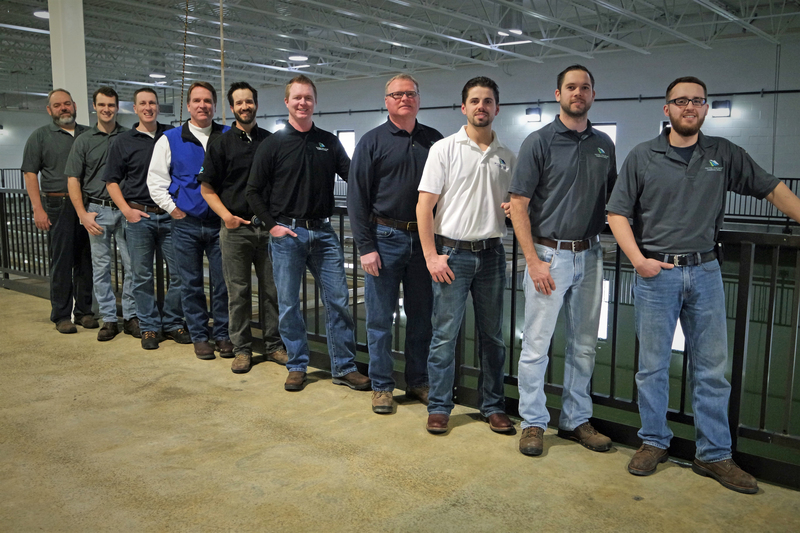 The Duchene Valley Water Treatment Plant was able to successfully meet all water quality goals, and deliver a new plant record for annual production (4,441 acre-feet), even with a significant algae bloom that presented water quality and production challenges. In 2018, treatment plant staff will focus on providing formalized training and employee development. Treatment plant staff will also continue to meet the water quantity and quality expectations of our customers. Central Utah Water maintains and manages the federally-owned Central Utah Project. Every year our staff is involved in the operation and maintenance of these facilities to be sure they operate and are maintained properly. Maintenance such as concrete repairs, tunnel inspections, and weed control are a regular routine. Some of the highlights for Central Utah Project features in 2017 included replacing a toe drain at Washington Lake, having comprehensive facility reviews performed by the Bureau of Reclamation at Upper Stillwater and Starvation dams, and many tours of the facilities. The 2017 Safety Evaluation of Existing Dams (SEED) Seminar brought working dam safety professionals from all around the world to tour and evaluate Upper Stillwater Dam. Central Utah Gardens began 2017 with a greater focus on educating the public. With this goal in mind, more opportunities for education were created through increasing the number of classes and workshops offered in the spring and summer months. 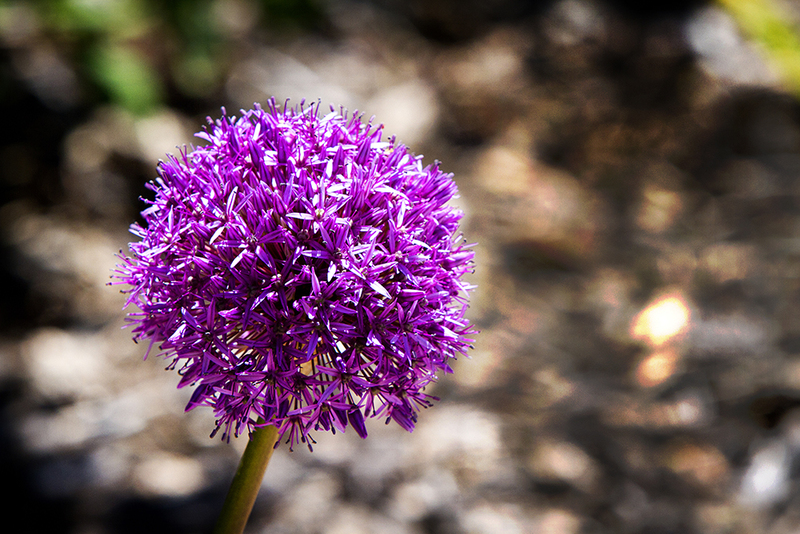 This year, Central Utah Gardens hosted 17 garden classes/workshops for adults and 9 classes for kids. Central Utah Gardens set a new attendance record with over 8,700 people in attendance - 200 more than their goal, and 300 more than in 2016. 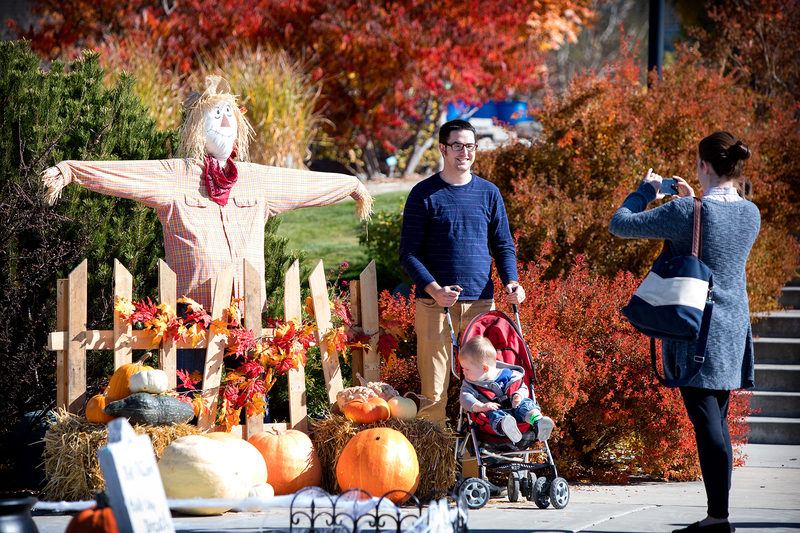 Central Utah Gardens’ two main events, the Water Festival and the Annual Pumpkin Walk, were both successful. The Water festival in May set a record with over 670 people in attendance, more than doubling attendance from the previous year. A new addition to the festival offered the chance for students to bring in their water-related, science-fair projects and show them off to the public. The Pumpkin Walk, a wildly popular event at the gardens, brought 2,100 people to the gardens for a day of education and fun for the whole family! This year, Central Utah Water’s Environmental team completed the North Fork Siphon Replacement Project Environmental Assessment. An environmental assessment on average can take about a year to complete, but due to the dedication of our staff, the assessment was completed in seven months. This quick turnaround will give both the design and construction teams head starts on the replacement of the North Fork Siphon. Central Utah Water, as a joint lead agency (JLA) with the Utah Reclamation Mitigation and Conservation Commission and the U.S. Department of the Interior CUPCA office, contracted with Utah State University in 2016 to conduct a flow study of Sixth Water Creek and the Diamond Fork River. This flow study is examining the overall health of these sytems with a goal of finding the most beneficial flow regime for the ecosystem. This year was the second year of this study. Sarah Sutherland, Environmental Programs Manager received the Patriotic Employer Award from the Utah National Guard. Central Utah Water’s Environmental staff also completed a categorical exclusion on the portion of the Olmsted Flowline which was replaced across the highway from Bridal Veil Falls in Provo Canyon. With the completion of the Environmental Assessment for Storage of Non-Project Water in Jordanelle Reservoir by our environmental staff, Jordanelle Reservoir may now be used to store non-project water with an approved Warren Act Contract in place and as space allows. This year also brought recognition to our Environmental Programs Manager, Sarah Sutherland. She received the Patriotic Employer Award from the Utah National Guard. This award is for contributing to national security, liberty protection, and freedom by supporting employee participation in America’s National Guard and Reserve Force. The June Sucker Recovery Implementation Program reached its goal of carp removal in 2017 not only in number of carp, but in weight as well. The program has successfully removed over 75% of the population of carp in Utah Lake, which has allowed the under-water vegetation to regrow. This is an important factor for the June sucker as it provides a habitat where fish can escape from predators. JSRIP has also seen the June sucker population increase as a direct result of stocking the lake with fish from a hatchery. These fish have continued to do well in Utah Lake and the threat of extinction has been greatly reduced. In 2018, the JSRIP team will focus on the Provo River Delta Restoration Project by obtaining the land needed and starting construction of the delta habitat. They will also focus on keeping the carp population low so that the June sucker population can continue to increase. Central Utah Water continued its conservation efforts within the community. Over 3,000 smart controller rebates were provided to residents through our residential program. Central Utah Water partnered with Saratoga Springs to help update their Advanced Metering Infrastructure (AMI). This program will continue to help water users know when and how much water they are consuming. In 2018, Central Utah Water will partner with Rocky Mountain Power and Cascade Energy for an energy management program. This program will help save a significant amount of energy within the District. Our residential rebate program will be switching to a state-wide, rebate program that will continue to offer rebates on smart-controllers. Central Utah Water will also launch a new commercial properties rebate program for flow-sensing technology. Central Utah Water’s IT team increased cyber security for the District by installing a dual-factor authentication for Virtual Private Networking (VPN). The IT staff also kept employees’ computers up to date by installing Windows 10. A new backup appliance was installed as well as updating firewalls to improve cyber security. 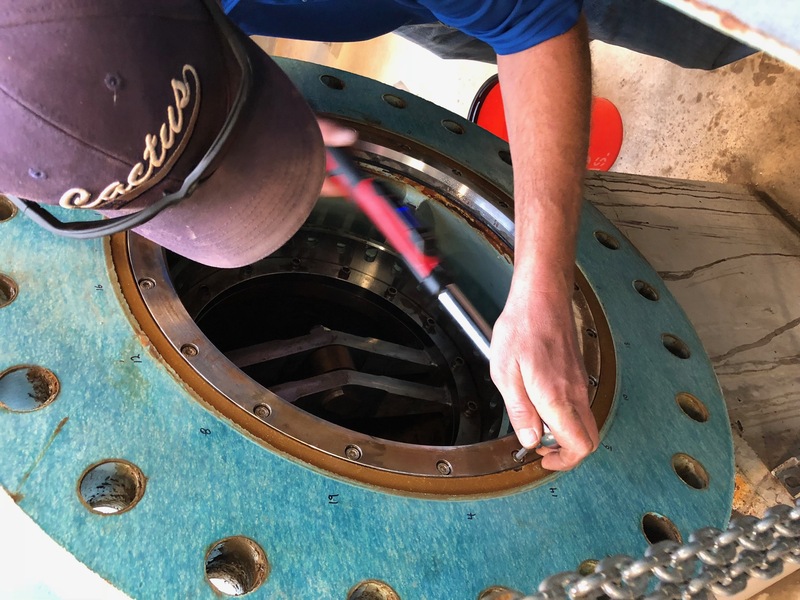 Central Utah Water’s Asset Management team focused heavily on data entry, software development, and streamlining processes for managing physical assets. The team was able to link thousands of drawings, operation and maintenance manuals, and knowledge transfer documents (KTDs) from Records directly into the asset registry. This will ensure that District staff can access these documents, at an asset level, directly from the registry. Software development was a major focus as well, with several applications developed during the 2017 calendar year. A new release of the Work Order System was a major accomplishment. The Blue Stakes Tracking Process was also rebuilt and improved. This system notifies District staff when the marking of underground utilities is required because of requested overhead work, or digging will be done in an area. The system assists District employees in accurately locating and marking our assets to keep them safe from being hit or dug up. On May 24, 2017, Central Utah Water organized and sponsored the Utah Lake Summit. Over 250 Utah Lake stakeholders met in one location and heard a panel of experts discuss a variety of topics essential to understanding the nature of Utah Lake. The summit was held at the Utah County Convention Center, where 14 different presenters shared history and insights about the challenges, complexities, and accomplishments in managing many aspects of Utah Lake. It was a busy year for Central Utah Water’s Engineering and Technical Services team. Previous engineering evaluations had determined that a 1,200-foot section of the 114-inch-diameter Olmsted Flowline in Provo Canyon needed to be replaced. Because this pipeline is the sole water transmission pipeline for water diverted from the Provo River to the users in Salt Lake and Utah counties, the replacement work had to be accomplished during the winter when water demands were low. The shutdown window was only 10 weeks. Engineering completed the difficult Olmsted Flowline Replacement Project with two weeks to spare. The Olmsted Flowline is now back to 100% operation. An ARC Flash Study was initiated in 2017 for the entire District. This study examines every electrical device and determines its arc flash potential. This study will determine which devices need special treatment, warning stickers, and detailed procedures when employees are working on those devices. This study is a significant safety project for Central Utah Water, and will help us keep our employees safe on the job. The Alpine Aqueduct is a 90-inch, steel pipeline that carries water from the mouth of Provo Canyon to customers in both Salt Lake and Utah counties. It provides water for over 1 million people. The extremely-wet year of 2017 resulted in a landslide that directly impacted the Alpine Aqueduct. Central Utah Water recognized that the slide could damage or even sever this essential pipeline. A contractor was mobilized under an emergency contract to install a large, earthen berm. This stabilized the slide and stopped it from moving and damaging the pipeline, thus avoiding a potential disaster. Engineering has begun designing and constructing projects using alternative project delivery methods. Several projects were commenced this year using the construction management general contractor (CMGC) delivery method, which involves a contractor at the beginning stages of a project to help with design, and then continuing to negotiate with the contractor on a final project cost. The Olmsted Flowline Replacement Project and the Ashley Valley Water Treatment Plant Chain and Flight Replacement Project were both CMGC projects that were completed in 2017. The upcoming North Fork Siphon Replacement Project and the CWP Vineyard Wellfield Collector Pipeline are also CMGC projects which will both begin construction in 2018 using the CMGC delivery method. 2018 will also bring about the completion of the Olmsted Hydroelectric Powerplant Replacement Project. This 12-Megawatt hydropower plant will be the 4th largest hydroelectric powerplant in the state. The District and Heber Light and Power Company (HL&P) formed a partnership in 2000 to develop the Jordanelle Hydroelectric Project. This project develops non-federal power at Jordanelle Reservoir under a lease of power privilege with the U.S. Department of the Interior. During 2017, a gross generation of 50,721.67 MWh of power was achieved. This is over 10,000 MWh higher than the generation achieved in 2016, and the second highest year since the hydro plant began operation. This is well above the average-annual, long-term, generation estimate. 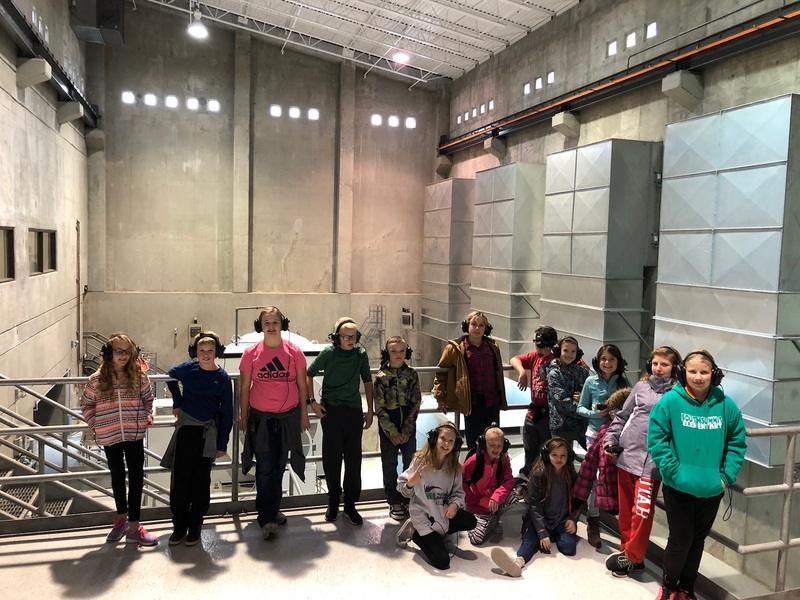 One of the highlights were the educational tours given at Jordanelle Dam and Hydropower Plant. 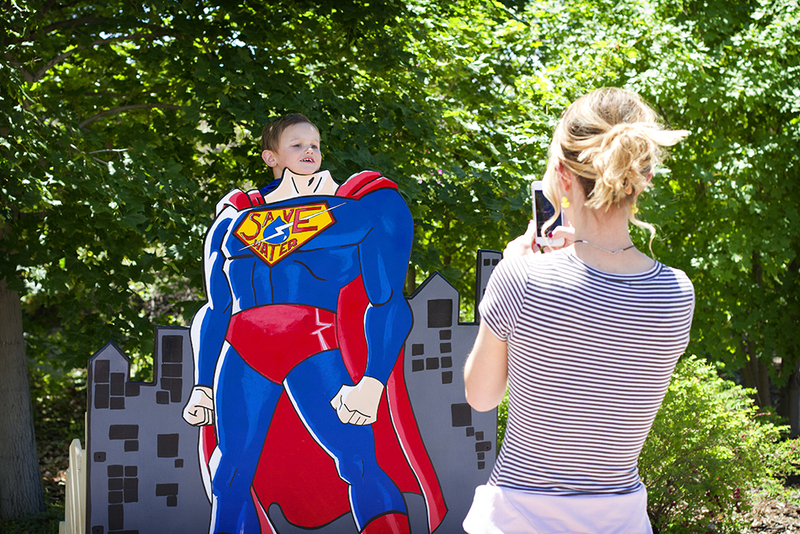 This year, over 300 students came to tour the facilities. Employee’s at Central Utah Water also met with the STEM (Science, Technology, Engineering, and Math) instructor of the Park City School District who instructs teachers on their teaching curriculum. 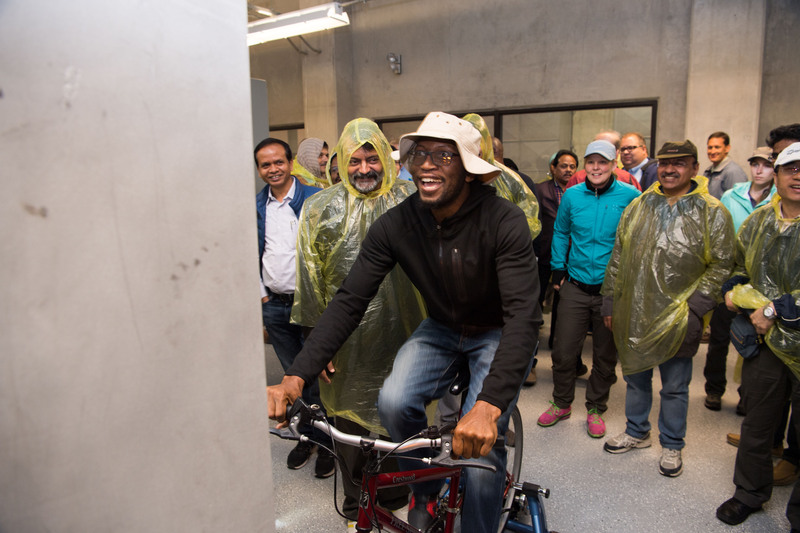 The STEM instructor brought a group of teachers to Jordanelle to learn about the different ways electricity can be generated, and how it can be taught to their students. Those teachers returned with students and showed them practical applications for their current classroom projects. 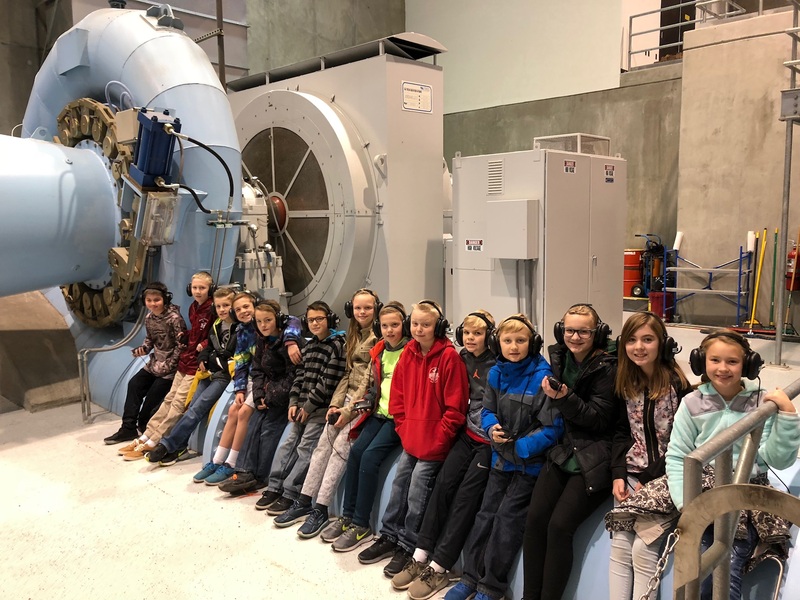 Working with those teachers and students to enrich their education has been a great experience for our employees at Central Utah Water. 2017 was a great winter snowpack accumulation season, and had the potential to break seasonal records. The snowfall slowed in February and March, but it was still a well-above-average snowpack year. Significant increases in reservoir storage during 2017 will be beneficial for the 2018 water year. 1This value represents the peak annual snowpack amount in percent of the peak 30-year median snowpack value for each respective SNotel site. The large snowpack of 2017 resulted in favorable reservoir storage levels. Reservoirs were regulated to optimize the balance beween filling and release patterns. In particular, Starvation Reservoir was drawn down significantly in anticipation of a high, spring runoff and was used to mitigate potential flooding. The Education Outreach team at Central Utah Water has three main goals to convey: 1) We are the water experts, 2) we are a caring part of your community, and 3) we do a lot with a little. To complete these goals, the team researched the Utah Core Curriculum looking for anything waterrelated and created two curriculums for teachers to use in their classrooms. Our team has been bringing teachers to our facilities for an all-day training on these curriculums, and it has been well received. The first curriculum is called “Water in the Classroom” and is focused on secondary school students. The second, “Everyday Engineering” was created for the 5th-7th grade, new, engineering standards. The Education Outreach team also started to develop relationships with other community educators such as libraries, after school programs, 4H, and the National Guard Youth STEM Program. Partnering with these community educators has been successful as well. 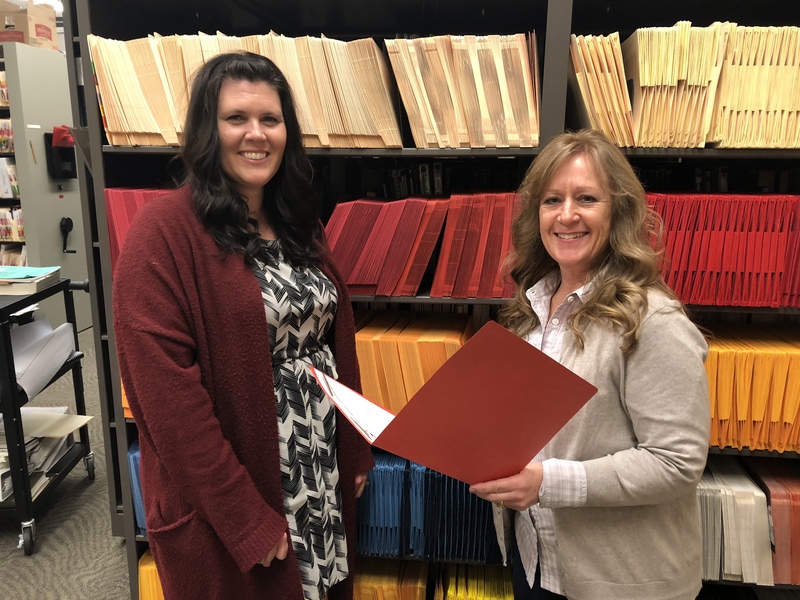 In 2018, The Education Outreach team has a goal to write two more curriculums and to give one training per quarter in Orem, the Uintah Basin, and Sanpete County. They reached over 14,000 people in the 2017 calendar year and hope to reach 20,000 in 2018. 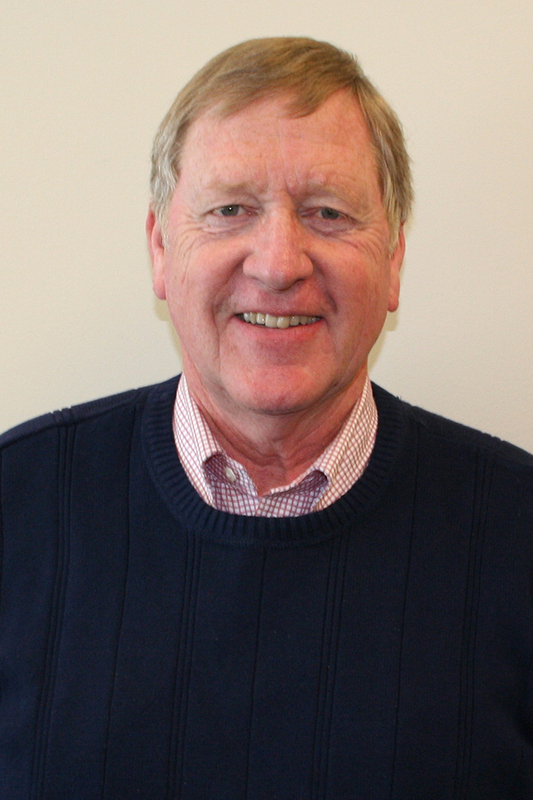 A special Thank you to Milt Thackeray, Rock Harrison, and Gordon Bodily for your years of service at the Central Utah Water Conservancy District.